Muni rider Cristina was forced above-ground, so to speak. That move led to a change of heart. Two years ago, I sprained my ankle really badly. I live close to Church and Market and I used to take the underground trains when I needed to get downtown. But since my ankle was in such bad shape, I started taking the F-Market because the stop is a block closer. I’ll never go back! I love the streetcars. All of them are beautiful. 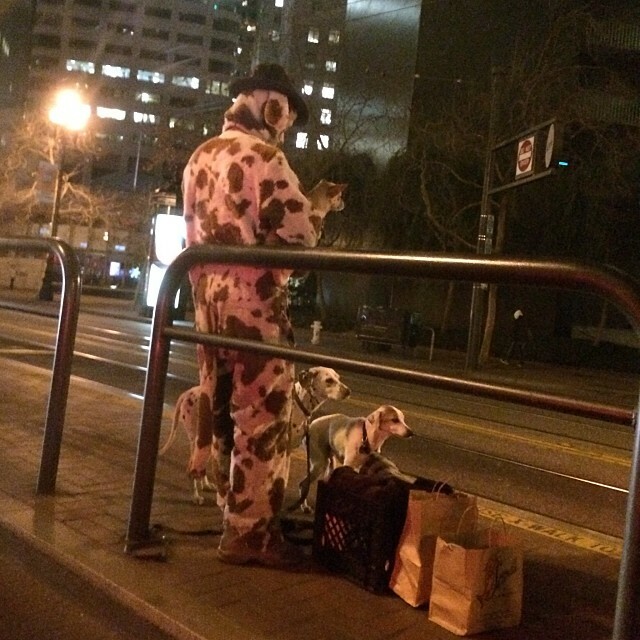 I love people-watching along Market Street. I love how even though it caters heavily to tourists, this line ends up serving all the types of people who live, work and hang out along Market Street. It’s my favorite ride in the city. Cristina translated her love of the streetcars into art. 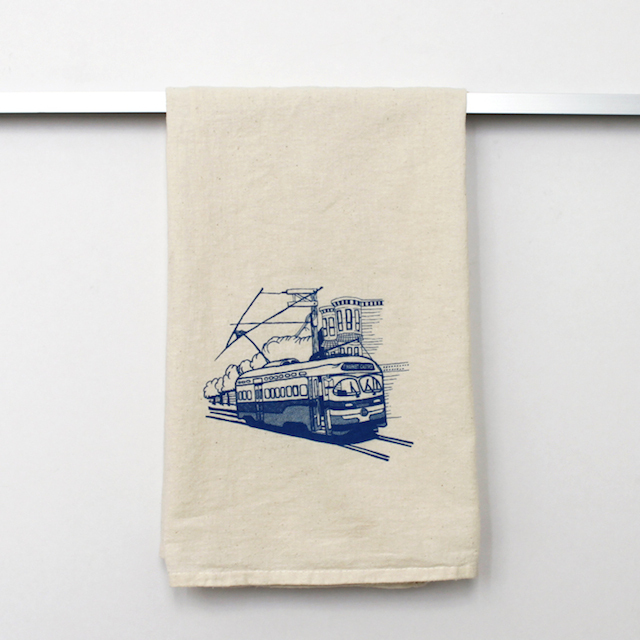 The image above is one of her F-Market dish towels. You can buy them at her Etsy shop. Guide human for blind dogs? Were-Dalmation? Or just Jim, stepping out at night like only Jim knows how to do? In any case, this comes to you via illusionofhope. You’re welcome. Are you firing up the grill yet? If you’re going to see fireworks tonight, don’t forget to check our transit advisory before you head out the door. We’ll return to our regular programming tomorrow! Nothing bad could come of this, right? Polly Wanna … Sweater? Muni Transfer? Who says only tourists ride the F-Market/Wharves? 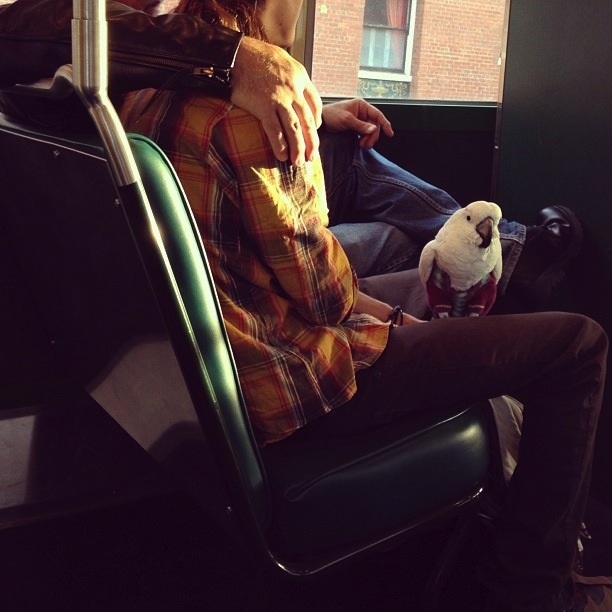 Because there is no way this sweater-/pants-wearing parrot isn’t local. Thanks for sharing, photographer @bsterling. Oh, follow us @munidiaries on Instagram if you aren’t already. 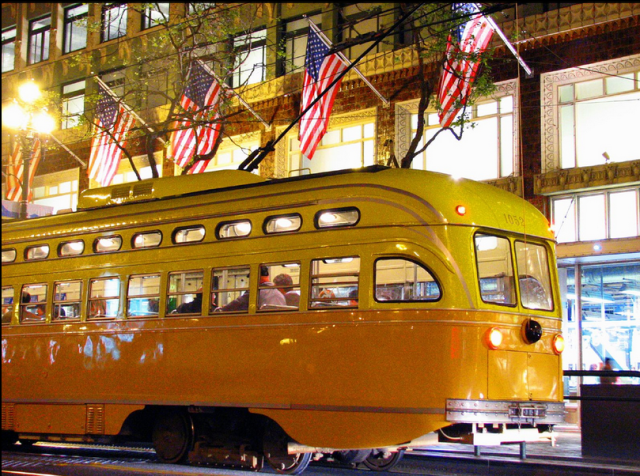 Wonder how the street cars get in the holiday spirit? 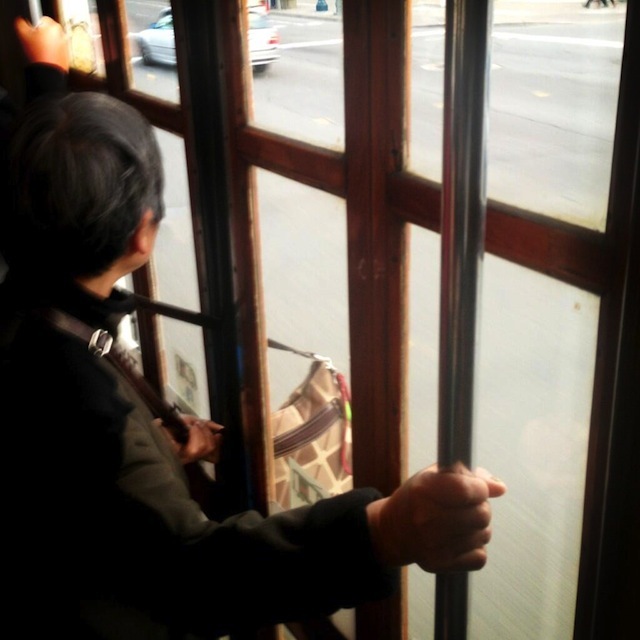 We’ve been lucky enough to join the Market Street Railway folks to decorate the street cars in the last few years. 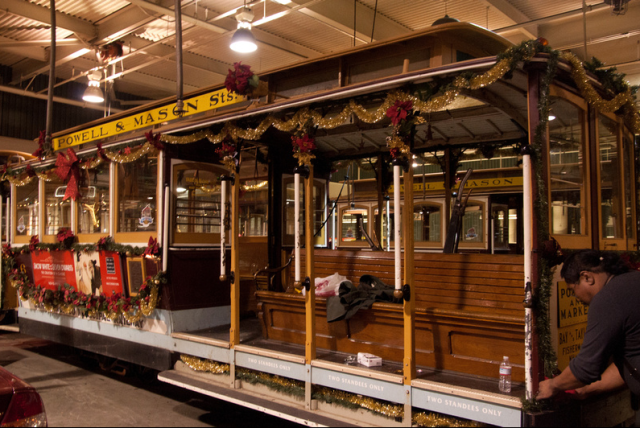 This year, Jeremy Whiteman of Market Street Railway sent us more photos of cable cars and streetcars all decked out in their holiday gear.